Dive into a world where mysteries are waiting to be solved, the past waiting to be uncovered, and the competition pursuing you at every turn. Should you push farther into the ruins to find the treasure, or should you deal with the pursuers at your back? Will you find the key to eternal life, endless riches, or will the pages of history close on you? In this game, you take on the role of a treasure hunter and compete with other players to gain the most Victory Points. 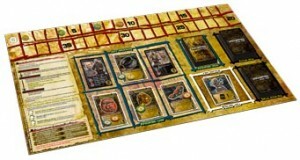 The variety of cards that you collect represent skills and items necessary for or sought after by treasure hunters. You can increase your chances of winning by adding useful cards to your play area. Venture into dangerous ruins, search them thoroughly, and defeat waves of enemies to become a legendary treasure hunters! The mysteries of the past unlock in the Uncharted Board Game, where you and up to 3 other friends compete to find treasure, defeat the competition, and ultimately succeed where others before you have failed. Will you fall victim to a trap set hundreds of years ago, or hold the power to shape the world itself? The choice is yours, but one misstep could spell the end of your adventuring career… permanently. Uncharted is mostly a card based game, but the board is very helpful. The objective of this game is of course to finish the game with the most victory points, however, it is designed so that there are many ways to get there. Beware though, if you have played the game on PS3, the theme music playing over and over in your head may keep you distracted, and that super Boss will take you out! Choose a hero based on your mood…you can be a hero in the classic sense, or your hero can be, well, on the shadier side (hero’s come from the console game characters). Either way, the game will play out the same, but it’s always funner to be in character. Your hero will have a unique number of health points, and depending on the difficulty level you choose, you may have unique special abilities as well that take effect when you meet certain criteria. In the main game area, there will always be a certain number of bosses and treasures. Finding the treasures by placing search tokens on them, and defeating bosses by accumulating damage cards in your personal card area, gives you victory points. Turn actions include playing a card (paid for by cards in your hand), placing search tokens on treasures, using cards in your play area, and battling bosses. Play in each round continues until all players have passed, and then the bosses still in the main game area attack. When a card pile runs out, the game is over. The game play is fairly basic, however, what makes this game really fun, are the game play modes. It makes what would be an average game, a great game. True to video game style, there are various difficulty levels (go for legendary, and prepare to get smashed), and also game types, and of course, bosses. I haven’t played all game types, but it really adds a lot to this game being able to play against other players in board game mode, or play with them in cooperative survival mode, or to finish it off with a good old fashion deathmatch. Lots of replay value as your strategy can change from game to game depending on the cards you get. It also has several different game make ups that make the game different each time. Well worth the purchase price. Heck, reviewing it makes me want to go play it right now. It is a card game at it’s heart. Not a deck building game mind you but you do ultimately make your “character” based on the cards you choose and go after. It elegantly blends combat with treasure hunting just like it’s namesake. If I hadn’t just played Fortune and Glory, I probably would have bought this game. For those that enjoy the Tomb Raider genre, and prefer card games over board games, this game would be a lot of fun. Picked it up in about 10 minutes, and was explaining the rules to others in 20. Solid game. In all fairness, I had to leave the game early, and only got to play one variant of it. It may have a lot of potential, but I didn’t get a chance to explore all the possibilities. Personally, I would have liked it more if it was more retro. The modern times feel/graphics/items didn’t appeal to me as much. Add a Review for "Uncharted: Board Game"